The following is a public safety blog post. If you or a loved one receive harassing phone calls from a stalker hiding their callerID (i.e. “Anonymous” or “Private Number” calls) you NEED to read this article. You’ll learn a technique the police and phone company haven’t told you — how to unmask the call and get their caller ID phone number and name anyway. First, let me briefly share my story about my own anonymous stalker and the difficulty I had obtaining help from the phone company and police. Then I’ll teach you the simple method that finally helped me to identify the stalker and end the calls, as well as safety tips and advice for handling stalkers and calls of this nature. This past year I have been dealing with an unknown stalker who hides behind a private number when he calls. He was a heavy breather, and the calls were always of a sexual nature. I offered no encouragement of any kind (positive or negative), only saying “hello” and immediately hanging up when I determined it was him. If it was a random caller just dialing numbers, this should have bored him into finding a more interesting victim to harass. However, since the calls didn’t stop I began to suspect that this man must know me somehow. Then I began to worry — what if he was someone I dealt with in the course of my work (a client or a colleague), or a neighbor, or…? What if I knew this person and encountered him in real life, unaware that he was my stalker? What if I found myself alone with him some day? My first step was to start a log of the date/time of the calls and any notes on what he said. I then called the phone company to see if they could help me find out who the last caller was. The answer was NO: due to current privacy laws, they could not reveal this information (or even see it themselves in some cases). They advised me to ignore the calls, keep a log, and contact the police if I grew concerned for my safety. After a few more crank calls, I did contact the local police. I spoke to a woman who listened, and then informed me that there was nothing the police could do since the caller hadn’t overtly threatened my safety. She did not take an incident report, or even ask my name. She advised me to contact the phone company instead. Was this OK? “No, not really” I said. Another call to the phone company confirmed what they said previously, but did gain me the direct phone number to Sprint’s “Corporate Security Department” which the police or a lawyer could call: 800-877-7330. After a lot of research online and a lot of bad information, I stumbled on a post by someone explaining a little loophole in the caller ID laws and a method to thereby reveal the callerID of someone who is using *67 to make their call private and hide their identity. It turns out that callerID blocking doesn’t work on 800 numbers (who have to pay for incoming calls) and that you can use “Conditional Forwarding” service on your phone in conjunction with a personal 800 number to unmask the caller. I’ll explain the technique and why it works in a moment. The first step (for Sprint users) is to dial “*38″ and press Call or Talk on your phone. (AT&T users: dial” ##004# and press Send. Verizon customers dial *73 and press Send.) The phone will appear to make a call and hang up. This cancels any Conditional Forwarding service you currently have on your phone. Finally, you click on a button to test the configuration. Trap Call will call your phone — do not answer it (either hang-up or ignore it). If all works correctly, you will see an “Activation Complete” message. Trouble-shooting tip: For my phone, this didn’t work the first time (callers didn’t reach Trap Call, they just got a disconnected tone if I didn’t answer the phone). After checking with my phone company, I learned that after doing the first two steps above, I also needed to Power Off, then Power On my phone. Then it worked like a charm. Finally, you can configure settings in your Trap Call account (you will log-in to the website with your phone number and your PIN.) Click on “My Phones” at the top, and then step through the side menu items. Under “Notification Alerts” you can choose whether to get a text and/or email alerts for missed calls, blacklisted calls and voicemails. Under “Recording Settings” you can choose whether or not to record calls, and whether or not to notify the caller that the call will be recorded. Quick note: Your voicemail will now go through Trap Call. Unfortunately, I don’t see a way to record a custom voicemail message at this time, so it is a generic greeting. Now, all you need to do is wait for your stalker to call again. Remember, if you answer the phone when it says “Private Number” or “Anonymous” then Trap Call can’t help. You have to hang-up or ignore the first call in order for Trap Call to do it’s magic and reveal the callerID when the phone rings again a few seconds later. Now that you know their identity, file an incident report with the police (just keep contacting them until you reach an officer that will listen and file the report), use your judgement about informing your family and friends of the stalker’s identity, and optionally go to the courts or contact a lawyer for assistance with a restraining order and/or a sexual harassment case. It is up to your own safety judgement, however, I chose not to reveal to my stalker that I knew his identity on this very first unmasked call. Rather, I recommend immediately filing a report with the police sharing the stalker’s identity. Then, you can choose whether to inform your stalker on the next call that you know who they are and have contacted the police, or just use Trap Call’s Blacklist feature to block their calls. Note that this isn’t always safe, though, as the stalker wants your attention and saying anything to them is giving them the attention they crave. Ideally, the police should be the ones to confront your stalker once their identity is known. First and foremost, have no contact with your stalker. Hang up. Avoid them. Stalker Safety Tips from End Stalking in America – Specific safety tips for at home, in your car, in public places, at work, and if your children are involved. Be careful when the caller says he/she is taking a survey. If you have any concern about the legitimacy of the survey ask the person for his/her firm name and phone number and tell them that you will call them back to verify the survey. Don’t play detective. Don’t extend the call trying to figure out who is calling. This or any other type of reaction is exactly what the caller wants and needs. Keep cool, don’t let the caller know you are upset or angry. Don’t try to be clever. A witty response may be interpreted as a sign of encouragement. Don’t try to be a counselor. The annoyance or obscene caller certainly needs professional help, but he/she will only be encouraged by your concern and will only continue the late night calls. Don’t tell everyone about your calls. Many calls of this type are actually made by friends, family members, or even your closest girlfriend or boyfriend. Place ads with caution. When placing an ad in the newspaper use a confidential box provided by the paper or a post office box. If you must use your phone number, do not list you address. Crank callers are avid readers of the classified ads. Remember, if the caller is a wrong number, they do not need to know your number. Never give your number out to an unknown caller. Report obscene or annoying phone calls to your local or campus police department and begin filling out a phone calls log. The information recorded in this log may provide valuable clues as to the identity of a caller and possibly establish a pattern or identify the location, source, or reason for the calls. Keep this log close to your telephone for convenience. If you have a friend at the phone company, your local police department, or women’s shelter please also let them know about TrapCall.com and encourage them to share this resource with women as a way of quickly identifying anonymous phone callers so their identity can be shared with police. (The much longer route requires a court order – I’d rather find out the identity when the calls START rather than waiting for the stalker to cross some dangerous line first.) Once you know your stalker’s identity, you are one step closer to safety and an end to the harassment. You can file a report with the police identifying the stalker, file for a restraining order with the courts, share the stalker’s identity with your friends and colleagues, as well as know who to be careful around and avoid entirely if possible. I hope this information was helpful to you. If you know of a woman (or man) dealing with anonymous, harassing phone calls from a stalker, please share this article. P.S. My stalker was identified, contacted by the police, and successfully charged, prosecuted and convicted. No more harassing phone calls! As a book artist, I love exploring new book forms, structures and bindings. I have found artist books to be the perfect creative art form, with limitless possibilities for artistic and personal expression. I also love learning new techniques and experimenting with other art forms. My Wee Planet photography series is a current passion! 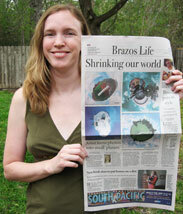 My Wee Planet Tutorial is published in Cloth Paper Scissors Mar/April 2012 issue! 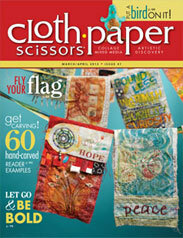 My art is published in Cloth Paper Scissors Sept/Oct 2011 issue! 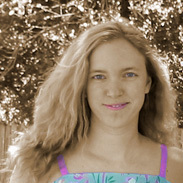 My art is published in Cloth Paper Scissors Nov/Dec 2011 issue! Creative business card display for artists: Slinky-powered! Artwork on the cover of Flair Magazine!